San Diegans suffering from drug and alcohol addiction face a number of other needs, particularly housing and mental health care. 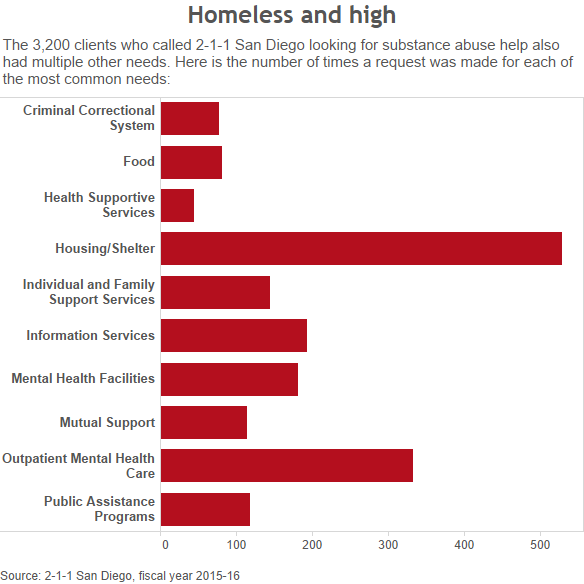 One of the ways drug users look for help is through 2-1-1 San Diego, a nonprofit that connects callers countywide with social service providers. Last fiscal year, it received calls from almost 3,200 individuals seeking help with substance abuse. Nicole Lasky is a data analyst with 2-1-1 San Diego. She said sometimes callers, referred to as clients, are looking for a specific agency or service. Often clients have more than one need, including more than one substance abuse problem. For example, a caller might ask for help with alcoholism, a heroin addiction and getting a job. Unsurprisingly, for clients looking for help with drug addiction and alcoholism, 71 percent of all their needs are related directly to substance abuse. Lasky said substance abuse tends to be “a very high primary need,” meaning it’s at the top of people’s minds when they call in. But that’s not the only issue these clients face. Looking at the remaining 29 percent of needs, one third were for housing and shelter, and another third were related to mental health care. More than half of those clients are in their 20s and 30s and the majority live alone. Slightly more than half of them are women (in contrast, overall 70 percent of 2-1-1 San Diego callers are women). Many of the substance abuse clients are low income. The average annual income of those saying they live alone was about $3,400. That average is particularly low because some individuals have no income. Some of those looking for help kicking their addiction come to the Salvation Army in downtown San Diego. The nonprofit provides a comprehensive rehab program for men and women. Teresa Whitney is a rehabilitation manager there. She sees individuals come into the program hooked on a variety of drugs, and often on more than one drug. And that’s just the addiction part of things. They might also have financial or legal difficulties. Whitney said the organization works with care providers to make sure those clients with mental health issues are stable enough to go through the program. “It’s the expectation rather than the exception that someone is going to walk in with some co-occurring disorder, in today’s world,” she said. Once participants are admitted, they go to detox and then live in the organization’s housing for six months to a year. They follow a strict program, separated by gender. That includes a “buddy” to guide them through the system, individual and group counseling, as well as bible study and religious services. Eventually, the residents move to transitional sober housing where they’ll stay two to three years. During the entire program, Whitney said, the Salvation Army helps residents address some of their other challenges, such as finding employment. “We have great opportunities for our folks to get their eyeglasses, get their teeth fixed, get (an) ID, even start a GED program,” she said. The Salvation Army’s rehabilitation center is the top referral destination for 2-1-1 San Diego clients looking for substance abuse help. Last year 2-1-1 made more than 400 referrals to the organization. 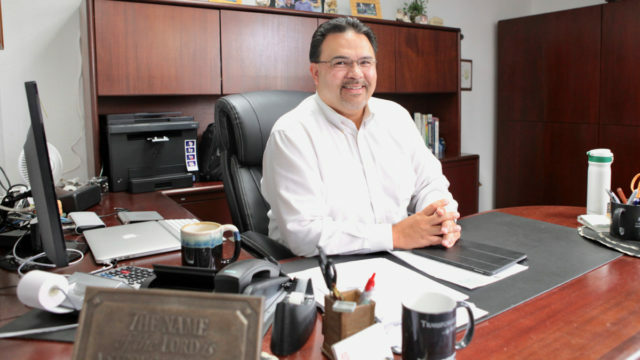 Graciani said that, unlike other rehab centers, the Salvation Army often has beds available because people don’t know about the organization’s drug and alcohol abuse services. The program is free to all participants, he said. It’s funded through sales at the Salvation Army’s thrift stores in San Diego. However, lack of beds is a large problem countywide. The resource hotline, 2-1-1 San Diego, tracks whenever it is unable to meet a need with a referral in a client’s community, Lasky said. The top five unmet needs for 2-1-1 San Diego clients involve where to live, including residential drug abuse treatment, sober living and homeless shelters.